Apartment Complex Roof Repair and Roof Installation in Southlake, Bedford, and Hurst doesn't have to hurt your property management budget. Southlake Roof Repair has partnered with many Apartment Complexes throughout Tarrant County providing the most Competitive Prices in the Metroplex. We understand that Multi-Family (Apartment) Complex Roofs have special requirements and needs, and to meet those requirements it takes a special team of specialized and trained Certified and Skilled workers. 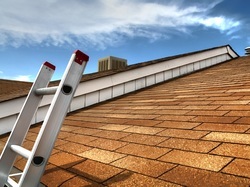 At Southlake Roof Repair, we are prepared to manage Apartment Roofing Needs, no matter the size, large or small. Our team of Certified Contractors and Commercial Building Specialists can put together a roof that not only compliments the exterior of your buildings, but also repels the damaging weathers North Texas brings. Roofs on Apartment Complexes are different than that on Residential homes. At Southlake Roof Repair, you can rest assured that we will use the proper materials for your unique roof, regardless of the type. No matter if you have asphalt shingles, metal sheets, or a beautiful tile roofing, we can and will fix it Properly and Efficiently. Energy Efficiency and Cost Efficiency are two areas we focus on with managing Commercial Apartment Roofing. Feel free to call our office at (972) 447-6337 to talk to one of our Roofing Specialists or Licensed Contractors about any questions you may have. We also offer Free Estimates; so you are welcome to schedule us to come out and give a quote on work. There are no obligations with our estimates.